The chase for the XTERRA Pan America Pro Series crown is in full swing this weekend at a new venue in Samana, a province on the northeastern Atlantic coast of the Dominican Republic. Four of the top five men and three of the top four women in the elite points standings will be on the peninsula fighting for points and prize money at the seventh of 12 stops on the tour this Sunday, June 3. The chase for the XTERRA Pan America Pro Series crown is in full swing this weekend at a new venue in Samana, a province on the northeastern Atlantic coast of the Dominican Republic. Four of the top five men and three of the top four women in the elite points standings will be on the peninsula fighting for points and prize money at the seventh of 12 stops on the tour this Sunday, June 3. In the men’s race all the ringers are there; Kieran McPherson (who won at XTERRA Argentina and XTERRA Brazil), Karsten Madsen (who won at XTERRA Uruguay), Branden Rakita (the runner-up in the Series last year), Josiah Middaugh (the reigning Series champ who just won at XTERRA Oak Mountain), Rom Akerson (who beat Josiah and Karsten to win XTERRA Costa Rica), and sixth-ranked Alex Roberts as well. It’s a seasoned bunch of guys for sure, with loads of experience and endurance to boot, but none are more traveled on the Pan Am circuit than Rakita, who gives us this valuable insight on DR.
McPherson, the tour leader through six, has been on fire this year, and has posted the fastest run split at every stop along the way. He most certainly is, especially after chasing down Madsen to win in Brazil a few weeks ago. Still, the Canadian (Madsen) is showing great strides of his own this season and was second to only Middaugh in a stacked field in Alabama two weeks ago. Madsen and McPherson both traveled to compete at back-to-back-to-back races in Uruguay, Brazil, then Alabama so took the last week or so to rest and connect with their families back home. They’ll need every bit of energy to get past each other, Middaugh, and the tiger from Costa Rica, Rom Akerson. Akerson, who won the inaugural XTERRA DR two years ago, was leading the race at XTERRA Oak Mountain heading into the run before experiencing some weird chest pains that dropped him to fourth by the finish line. Beyond the finish line is the experience, and the travel and discovery of this race in Samana speaks to the spirit of the sport. In the women’s race Kara LaPoint is looking to win her first XTERRA World Tour major, Kelli Montgomery is looking for her second, Fabiola Corona has her eyes on the big prize, and Nike Matanza is looking to see where she stands among the tour’s top performers. 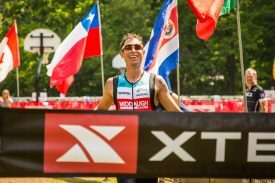 As for Corona, the 4x XTERRA Mexico Champ who took top honors at XTTERRA Argentina earlier this year, the goal is clear. Corona sits in third place in the standings, behind Montgomery and tour leader Carito Nieva, but could jump into the top spot with a good showing in Samana on Sunday. She’ll have to get past a determined Kara LaPoint, who was the runner-up in the Pan Am Pro Series last year and is just starting to find her groove on the run after an early season injury.